I've been a HUGE Lincoln buff since childhood, and last week received a message from Bill Walker telling me he'd just ordered my Lincoln/Civil War paranormal A NECESSARY END, and that he'd written a few alternate history books featuring Lincoln. Of course I checked out his books and invited him to be my guest here. 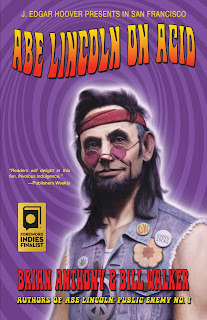 I ordered his latest title ABE LINCOLN ON ACID but haven't read it yet. This is one Lincoln book out of the fourscore plus I've read that I couldn't pass up. Bill is an award-winning writer whose works include novels, short stories and screenplays. His first novel, Titanic 2012, was enthusiastically received by readers, and Bill's two short story collections, Five-Minute Frights and Five-Minute Chillers, are perennial Halloween favorites. A highly-respected graphic designer, Walker has worked on books by such luminaries as Ray Bradbury, Richard Matheson, Dean Koontz and Stephen King. Escaping Hoover's clutches with a clever bit of deception, he navigates an even more treacherous and unfamiliar terrain, finding an ally in John Voci, a young San Francisco folk-singer. Together they journey across a counter-cultural landscape, meeting those who believe a great man has returned, and striving to remain free from those who want to bury him once and for all. Lincoln walked off among the graves, pausing now and then to study the names and dates on the stones still legible. According to what he’d read, the cemetery had buried both whites and blacks when it was founded in 1808, the year before his birth; it had become exclusively black in the 1840s, remaining in use right up until its abandonment in 1950. Lincoln felt an acute kinship with that abandonment. After surviving Booth’s fateful shot, the government had hidden him away, content to let him slumber in obscurity rather than let the world know he lived. They’d been afraid of what he might do if he ever awakened. Afraid he would usurp their precious power. Perhaps now times had changed. Perhaps now they would let him live in peace. How ironic that she was born the day John Brown was hanged for treason, he thought. And how ironic that I should be standing on this very spot in the here and now to note it. He glanced toward the SUV then back at Hannah’s headstone. It was another moment before the significance of the second date sank in. The tears returned and he let them fall. “Such a calamitous day for us all, Hannah,” he said with a hitch in his voice. At least she’d lived a full and worthy life. The same could not be said of his old friend John Dillinger. His brief, meteoric existence had left an indelible mark on the national consciousness. Some, such as J. Edgar Hoover, had reviled him as a common thug, while others hailed Johnnie as a latter-day Robin Hood. He was neither. Lincoln remembered him as a determined man fiercely loyal to his friends and family until the bitter end. A better man than those who’d brought him down. Sighing, Lincoln knelt down and placed the roses on Hannah’s grave. The grass immediately surrounding him was browned and sparse, the roses offering the only splash of color in the otherwise pallid gloom of an overcast day. He knew she was beckoning him home. But the spell of John Wilkes Booth’s bullet, cursing him with eternal life, was stronger than the natural order of things. The tears filled his eyes again and he reached out and touched the headstone, feeling warmth radiating from it that should not have been there. “Show me the road, Hannah, and I will gladly walk beside you.” Lincoln mouthed a silent prayer of his own and rose to his feet. He turned and saw the young FBI agent standing at a respectful distance. Lincoln climbed in and a moment later they were on their way. Mullens.... The young federal agent who had been so kind to him in 1933, and suffered Hoover’s wrath for it. Lincoln smiled sadly and settled back into his seat with a hiss of fragrant leather. Some things never changed. Probably read, play guitar, or watch a film. I love to read books about time travel, as well as suspenseful fiction of all types. I love biographies and Civil War and World War II histories. Mostly classic rock, especially favorites such as Jimi Hendrix, Cream, Black Sabbath, AC/DC. But I also appreciate progressive rock, my favorite band in that genre being Emerson, Lake & Palmer. Weightlifting, reading, and guitar playing, but not necessarily in that order. Unfortunately, my favorite foods tend to be fattening, and I’m not eating any of those lately. If a fairy grants you one wish and one wish only, what would it be? Why? To be a popular brand name author. I regret not taking writing more seriously earlier in my life. While I’ve always had a talent and a facility for words, I didn’t sit down to truly learn the craft until the early 90s. I think if I’d started in college, I would have been published earlier. I’m not a thrill junkie, but I can answer the question: It was writing my first novel and submitting it for the first time. That felt pretty adventurous to me. I wrote my first book when I was nine years old. It was about an intelligent mouse, who, with his human companion—a young boy—would get into various hair-raising adventures. It was inspired by the children’s book Ben and Me. So, I guess you would call my first book a pastiche of sorts. The first true novel I wrote is Camp Stalag, a story where the children of WWII veterans learn a hard lesson about what the war was really like. Did you encounter any obstacles in writing? What are they? How did you overcome them? I wish I was as prolific as some of these brand name authors are, although I suspect that some of them are getting help. It’s only ones like James Patterson and Clive Cussler who are gracious enough give their collaborators credit. So, I guess my biggest obstacle is coming up with an idea that won’t let go. I need to be obsessed with a potential story to carry it through. How did you feel when you receive your first contract? What did you do? Any celebratory dinner, dance, event, etc to commemorate the occasion? My first published novel was the second one I wrote, which is entitled Titanic 2012, and is about a descendant of John Jacob Astor rebuilding the ship for the 100th anniversary of the sinking. Cemetery Dance published it in 1998, as both a signed/lettered limited edition hardcover and a trade hardcover. The interesting part of this story is that I had been a longtime collector of CD’s books and had gotten to know the publisher, Rich Chizmar. When I told him about Titanic 2012, he asked me to send it to him. I said, “sure,” figuring he’d read it and give me a nice pat on the back and that would be it. Instead, two weeks after I’d sent him the manuscript, he faxed me an offer. To say the least, I was floored—ecstatic. Here was validation! It may not be Random House, but Cemetery Dance is highly respected. Another little tidbit: it was also around that time that Rich hired me on as a freelance book designer. I’ve designed dozens of their titles, but the first one was—you guessed it—Titanic 2012! That was also very satisfying, because I had total control over the look of the entire book. Let me just say that authors almost never get a say in layout and design, so I considered myself fortunate. Any writing peeves, things you wish you could improve on, things you do with exceptional talent? I wish I was a better self-editor, which is one of the advantages of working with a collaborator. My co-author, Brian Anthony, is a much better editor than I am. I, on the other hand, excel at plotting. For me, knowing just where to place the plot twists, is nearly instinctual. When I’m in the midst of writing a book, I’m in what I call “Story Mode” 24/7. I’m always thinking about my story, trying out different things. This comes in handy when I get stuck as my mind will work the problem until it’s solved. As to where I write, it can be anywhere my laptop can go. I am able to tune out distractions and live in the world of my creation. Sometimes it’s just a title and other times it’s a premise that intrigues me. With one of my books, Abe Lincoln: Public Enemy No. 1, it was the title. The irony of that is my co-author came up with that title back in college. In fact, we even shot a short film that was basically a scene of Abe robbing a bank in the 1930s. That film sat on the shelf for nearly forty years. We dusted it off and cut it together, and during the process, I said to Brian, “You know, this would make a great premise for a novel.” And I was off to the races. It only took forty years! What books can you recommend to aspiring writers to improve on style, character development, plot, structure, dialogue, etc? The two best books I’ve ever read are written by two of my favorite authors. How to Write Best-Selling Fiction by Dean Koontz and On Writing by Stephen King. Koontz’s book was originally published by Writer’s Digest and is long out of print and a valuable collector’s item. It is also an invaluable tool. I’ve been toying with the idea of approaching Mr. Koontz about revising and republishing the book. The main thing I would stress is discipline. Write three pages per day, no matter what. You can write more, but that doesn’t let you off the hook for the next day. If you force yourself to write those three pages every day, you will have a finished draft in a couple of months. Among those that you’ve written, which is your favorite book and why? It’s hard to play favorites. There are things I love about all of them. However, if I had to pick one that truly resonates with me it would be A Note from an Old Acquaintance, which is a romance/love story written from a man’s perspective. I wanted to give Nicholas Sparks a run for his money. I get them from anywhere and everywhere. Sometimes I’ll have a vivid dream or I’ll read or see something that sparks an idea. Which book that you’ve read (not one of yours) is the closest to your heart? Why? My favorite book is Jack Finney’s Time and Again. The original time travel love story. It was published in 1970 and has developed a cult status. Still waiting on the movie. Second and third favorite books are A Clockwork Orange and Somewhere in Time. Which of your heroes/heroines is most similar to you? Why? That would be Brian Weller from A Note from an Old Acquaintance. Like me, he aspires to be a bestselling author. The main difference is that Brian achieves his ambition in a big way. are moving it in another direction? What did you do in such a situation? Yes, that happens quite a bit. When it does, I very often know instinctively that it’s the right direction. At other times, when it’s not, I start writing slower and slower until it grinds to a halt. And that’s when I realize I need to go back and try something else. I like to work different genres, as it keeps me from getting bored. Suspense, Horror, Science Fiction, Alternative History, Romance/Love Stories, and Fantasy. Now, I don’t mean fantasy in the way that publishers do. I don’t write stories about magic, elves, and dragons. To me, that is only a corner of what fantasy means, but is inevitably what everyone thinks of when you mention it. My version of fantasy, is one where you take the normal world and throw one fantastical thing into it, such as a voodoo curse that backfires and leaves us with an immortal Abraham Lincoln. The masters of that kind of fantasy were Jack Finney and Richard Matheson, both of them being huge influences for me. I actually enjoy the entire process of conceiving, writing, rewriting and publishing. Again, self-critiquing is something I don’t enjoy, but it is a necessary evil. As I advised other writers, I endeavor to write three pages per day, or more. Each morning, I’ll read over the previous day’s work and—more often than not—I’ll see something that needs tweaking. So, I do edit and revise as I go. I actually hate the idea of open-ended research or over-researching something. Instead, when conceiving an idea, I’ll have specific questions that need answering and I’ll go about finding those answers. It could be a major or minor plot point. For example, in Abe Lincoln On Acid, we have Lincoln listening to Martin Luther King give a sermon. I was able to have my characters in the church on a particular day and I excerpted the actual sermon MLK delivered on that day. I find those kinds of details really enjoyable. For both Lincoln books, we endeavored to put as much real history into the story as we could. 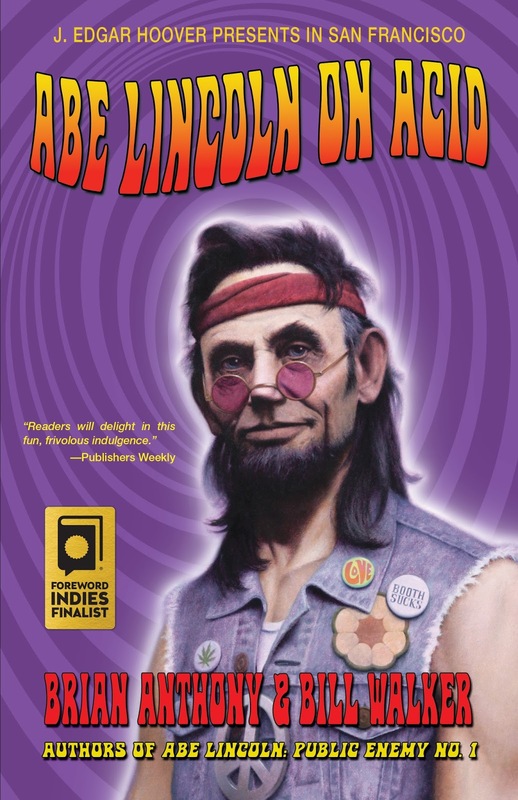 Abe Lincoln On Acid was inspired by its predecessor, Abe Lincoln: Public Enemy No. 1. The first book was such a kick to write that we wanted to keep it going. As much time as I can without taking away from doing the writing. I’ll be honest, I don’t enjoy promoting, at least not the kind that an independent author has available to him or her. I think the Internet has actually made it harder to be noticed because everybody and their brother are promoting their book. There is also the stigma one has to overcome that self-published books are crap. While that’s unfortunately true to a great degree, there are gems out there. I guess what I’m getting at is one can spend eight hours per day and more money than the book will ever earn and not make the tiniest of splashes. It’s disheartening, but I keep writing, because it’s what I do best. I’ve been a filmmaker and a graphic designer. I really do believe I was born to write. I’ve always loved it. Do you have or belong to a writing organization? Which one? I currently belong to the Authors Guild, an organization that looks out for the interests of authors worldwide. There are some writers who refuse to read anything while they’re writing. I don’t subscribe to that. To me, any and all reading feeds the muse—and she is VERY hungry! Do you have a favorite book from childhood? The aforementioned Ben and Me, as well as a collection of short stories called The Mad Scientists’ Club, which are about a group of kids who use their brains and their wit to construct all kids of mischief. These were written well before the age of computers and cell phones and contain a certain whimsical magic.